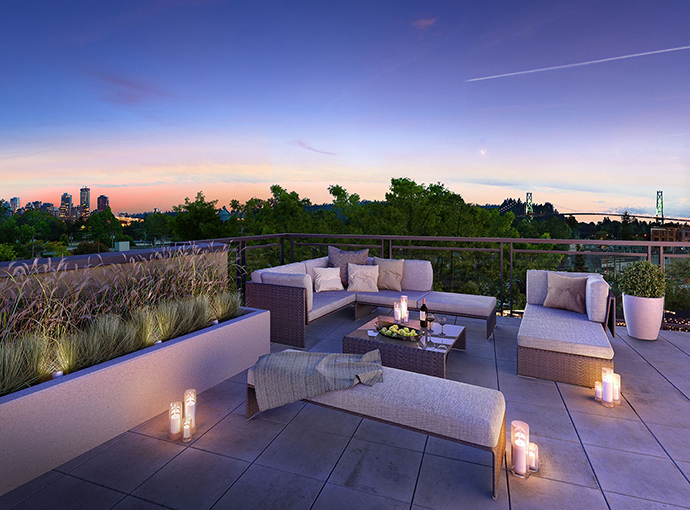 The Vancouver Condo Buzz » The North Shore x61 Condos along Marine Drive North Vancouver District Featuring 1-3 Bedroom North Van Apartments for Sale! « From <$400k! South Vancouver RHYTHM at River District Condos by Polygon > Preview Vancouver Riverfront Condos Right Now! Urban by nature, this new collection of 1, 2 and 3 bedroom North Vancouver X61 condos offers contemporary West Coast architecture as well as a great location near the diverse city amenities and outdoor recreational options of the North Shore. 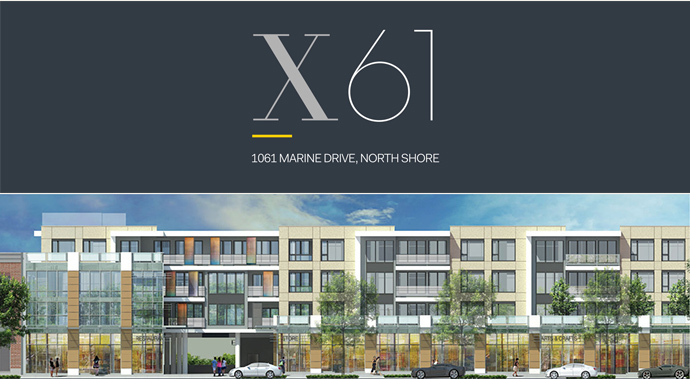 The new X61 condos will be located at 1001 Marine, North Vancouver. The clean and modern exterior design features privacy screens, metal solar shades, large windows, stone cladding and composite cement panels for a truly distinct and urban look and feel. There are patios and spacious balconies for most homes and the south facing landscaped courtyard amenity space is truly spectacular. There is also a public amenity walkway through the internal courtyard of the development. The convenience of city living on the North Shore is right here at X61 North Vancouver condos where you will find one, two and three bedroom floor plans situated in the dynamic and ever changing Marine Drive District that has seen a recent transformation. The North Shore X61 Condos is all about living in a walkable neighbourhood to restaurants, amenities, services, shopping, recreational options and everything that the city has to offer. Plus, Downtown Vancouver is a short 15 minute drive via the Lions Gate Bridge, and the local mountains are just minutes away as well. The Central and Lower Lonsdale neighbourhoods are just 5 minutes away too. The building itself will feature convenient FOB and enterphone access from the lobby entrance, secure FOB floor access controlled elevator as well as a gated secured underground parking garage. All homes at the North Vancouver X61 condo building will also come with the standard 2-5-10 Home Warranty protection plan. More information about this amazing Marine Drive North Vancouver real estate development is located online at www.x61living.com. 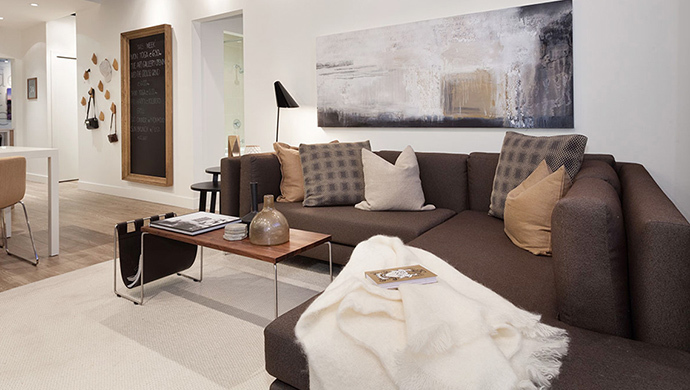 X61 is the latest in a series of communities by award-winning developer VivaGrand. The distinct architecture is designed by Integra Architecture. The design is by Area3 Interior Designers. Sleek modern architecture, clean contemporary interiors—from floor to ceiling, inside and out, the homes at X61 spare no detail in proving they’re more than worthy of their spectacular surroundings. An exceptional array of interior features and homebuyer choices for interior finishes make the Marine Drive X61 Condos in North Vancouver a must-see for any homebuyer seeking a new residence on the North Shore. The inviting interiors include elegant laminate floors throughout the main living areas in addition to bedrooms with plush carpeting and great underlays. As well, the interiors at the Marine Drive X61 Condos in North Vancouver will come with sheerweave window roller shades for added privacy in addition to recessed pot lights in the home. Other great interior features include a Whirlpool front loading stacked washer and dryer in a laundry closet as well as closet shelving. The beautiful bathroom finishes at X61 North Van condos includes square eased edge polished quartz stone vanity counter tops with polished finish in addition to contemporary square edge laminate cabinetry. Other bath feaqtures include polished chrome accessories, sleek Hansgrohe chrome showerhead and a Duravit under mount sink and skirted bathtub (deep soaker in select plans). Also available for the bathrooms includes a Hansgrohe chrome faucet, Duravit two piece toilet with soft close seat and frameless glass shower enclosure with swing door. The X61 Condos on Marine Drive North Vancouver also come with large format 12×24” porcelain tiled flooring as well as brushed steel and white wall sconce light over the mirror and vanity. There is under cabinetry shelving with vanity drawer for extra storage and a vanity mirror with polished edges. 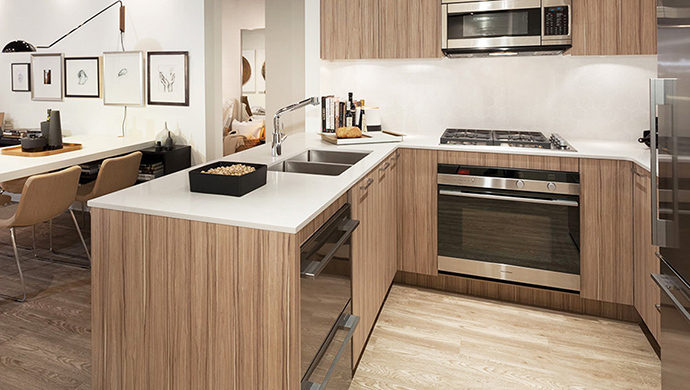 The fabulous kitchens at X61 North Shore condos also feature premium quartz counters that are polished and have square eased edges in addition to contemporary square edge laminate kitchen cabinetry with finger pulls on the upper cabinets and under cabinetry puck lights. Other kitchen features include a Lazy Susan as per floor plan, in sink disposal unit by Waste King and an undermount stainless steel kitchen sink with a Hansgrohe faucet. The premium stainless steel appliances are by Fisher & Paykel and they include a fridge with bottom mount freezer, over the range microwave, double dish drawer dishwasher, built in oven and a four burner gas cooktop. A home where you can enjoy the outdoor lifestyle you know and love from the comfort of a walkable urban neighbourhood. 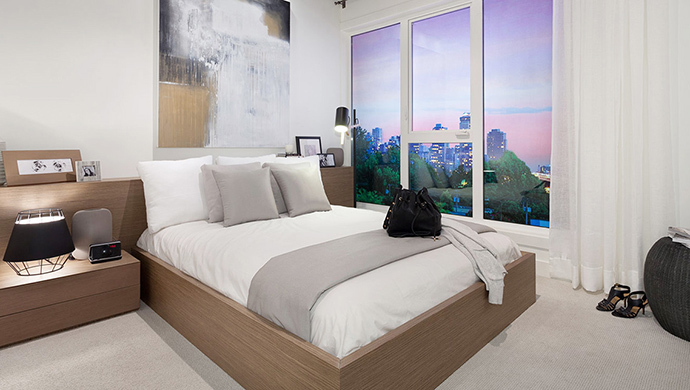 North Vancouver’s X61 condos make city living livable. There is a wide selection of floor plans available at X61 Condos that includes 1 bedrooms from 456 square feet to 611 square feet. The 2 bedroom condos and North Shore X61 Townhomes range from 659 square feet to 954 square feet. Some of these are even 2 level floorplans and others have large patios. There is 1 three bedroom X61 townhome floor plan that is 1315 square feet in size over two levels with a large 141 sqft patio. There is also Floor Plan D1 (980 square feet plus 742sqft patio) which is a three bedroom one level layout. THE BEST IN NORTH VANCOUVER REAL ESTATE MARKET! Walkable location. Large balconies. Quality kitchens. Urban by nature, X61 North Vancouver condos brings the convenience of city living to the North Shore. New North Van X61 Condos start from the $200,000’s and there will be a fine selection of one, two and three bedroom floor plans to choose from. X61. The Best in North Vancouver. Walkable Location, Large Balconies, Quality Kitchens. The grand opening launch of X61 North Vancouver condos is in late October with presales extending through the year! The new North Shore condos will start from just $238,900 and the X61 North Vancouver condo presentation centre is now open at 1061 Marine Drive, North Vancouver.